Fabrication, installation and maintenance on all forms of thermal insulation and refrigeration work. A family run business, with our combined management team having over 100 years experience in the asbestos and insulation industry. Need an Asbestos Sample Analysis? We accept samples at our Head Office in Gt. Yarmouth. Give us a call for a quote specific to your needs. Established in 1983, we are a family run business, with our combined management team having over 100 years experience in the asbestos and insulation industry. East Coast Insulations are the longest established asbestos licensed firm in the area. The East Coast Insulations team is vastly experienced in asbestos and thermal insulation works. Whatever the size or complexity of a project, East Coast Insulations have the workforce with the right skills and training to complete the job. East Coast Insulations continuously invest in our staff training and development program, keeping up to date with the latest regulations, guidelines and Approved Codes of Practice from the HSE. The team currently has two operatives undertaking apprenticeships as Insulation Engineers. 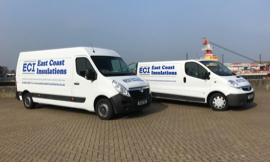 •East Coast Insulations has a team of 19 qualified staff and cover the whole of East Anglia. Small enough to care but large enough to cope. You can expect the same customer care and service no matter what the size of the job.